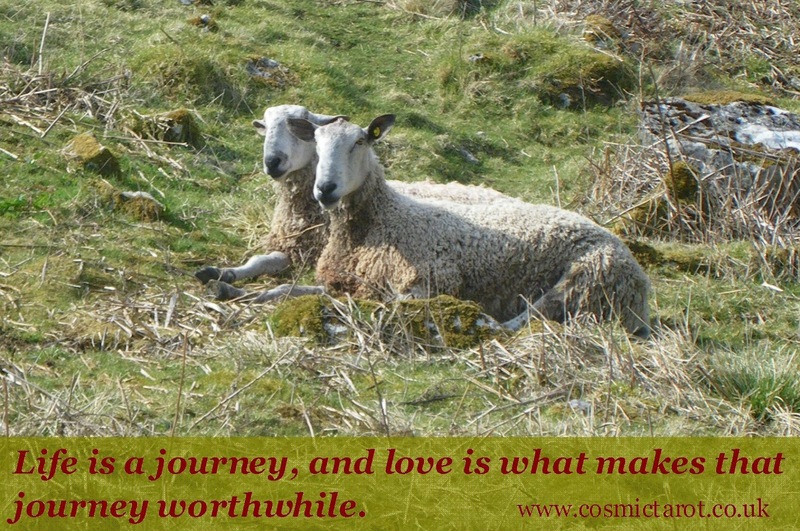 Isn't that woolly couple adorable? I captured them a few years ago whilst on a walk in the Yorkshire Dales; a perfect picture of mutual affection and companionship. You are welcome to share this image (unaltered) on the web. Enjoy your weekend! The number Five in Tarot spells trouble, especially the ones in the Minor Arcana. 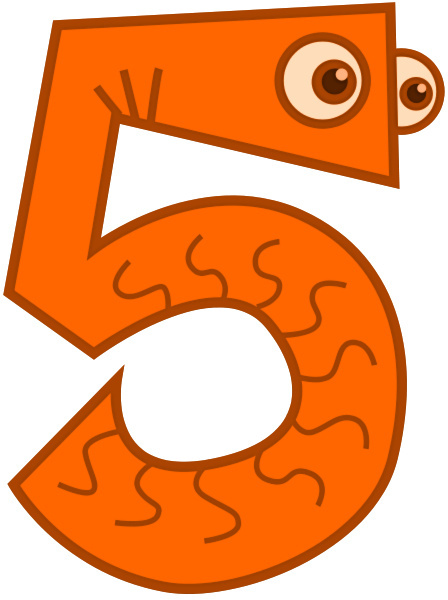 The number Five is associated with the planet Mars, "God of War", and indicates a challenge of some sort. The Five of Wands depicts a confrontation, the Five of Cups emotional upheaval, the Five of Swords a hollow victory (or a defeat), and the Five of Pentacles financial hardship. But what about Arcanum number 5, the Hierophant? 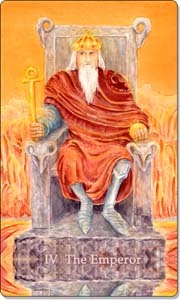 This character seems benevolent on his throne, advising or preaching to his disciples, but the Hierophant is associated with ethics, morality, education, humanity and conscience, all of which can cause struggle, tension, upset and many heated discussions in addition to narrow-mindedness, intolerance, prejudice and radicalisation. If the Hierophant stands for religion, does the number Five indicate its inherent tendency to create havoc? However, all is not lost. The number Five is asking for mediation, a middle way, re-instating the equilibrium, which is perfectly represented by Temperance, Arcanum number 14 (1 + 4 = 5). Temperance is a healing card, the angel a religious symbol, which suggests the need for compassion, mercy, forgiveness and moderation in times of strife. The Fives may indicate a tough situation, but at the same time they offer an eye-opening experience and eventually resolution and progress ahead. 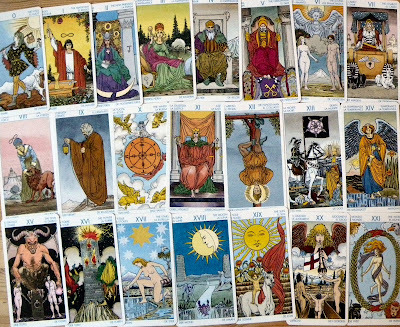 For more information on the significance of numbers in tarot, check out my article Tarot & Numbers. The High Priestess symbolises intuition, the unconscious, hidden knowledge and spirituality. The image we see here is from the self-published Anna K.Tarot, its beautiful artwork dominated by blue and yellow colours reflecting darkness and light. “I invited Intuition to stay in my house when my roommates went North. I warned her that I am territorial and I keep the herb jars in alphabetical order. Intuition confessed that she has a ‘spotty employment record.’ She was fired from her last job for daydreaming. When Intuition moved in, she washed all the windows, cleaned out the fireplace, planted fruit trees, and lit purple candles. She doesn’t cook much. She eats beautiful foods, artichokes, avocadoes, persimmons and pomegranates, wild rice with wild mushrooms, chrysanthemum tea. She doesn’t have many possessions. Each thing is special. I wish you could see the way she arranged her treasures on the fireplace mantle. She has a splendid collection of cups, bowls, and baskets. Can you see the High Priestess living her life like Intuition? What do you think? 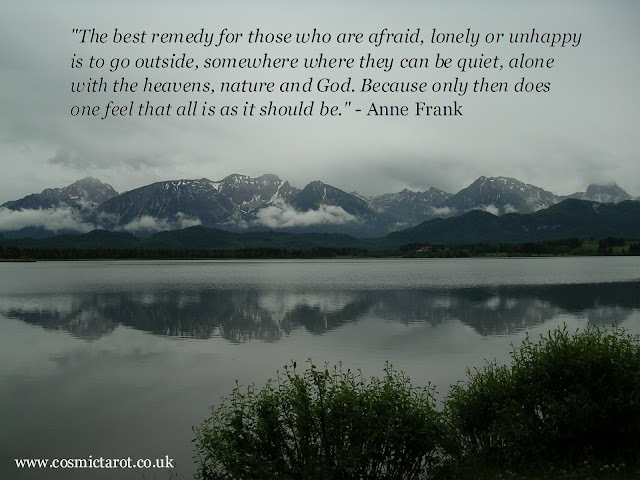 This image was taken on a trip to the Bavarian Alps in 2006. Please feel free to share it with your friends. Have a great weekend! 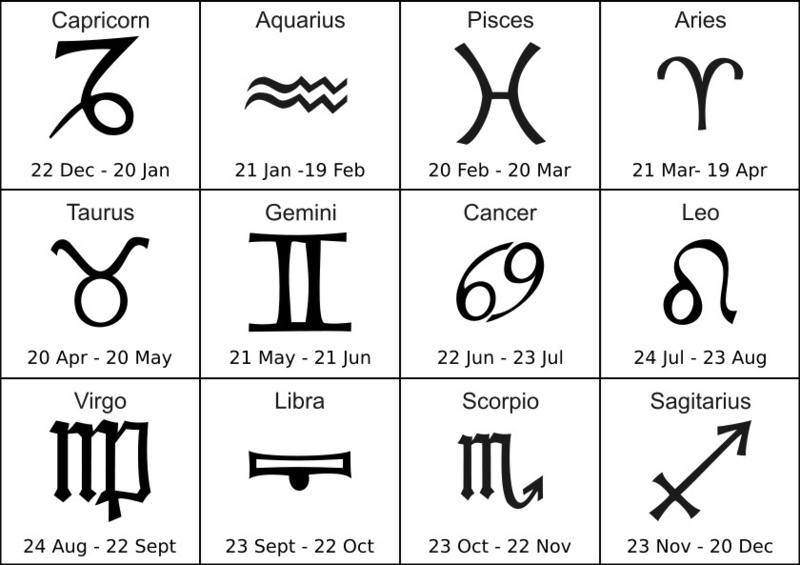 The Emperor is associated with the zodiac sign Aries. If Aries is either your sun or your moon sign, then the Emperor is your zodiac card. The sun sign reflects your conscious, expressive, outward, open personality; how you engage with people and the world around you. The moon sign reflects your unconscious, hidden, blocked personality traits, instincts and emotions; you feel them within. If you would like to know more about your zodiac cards based on your astrological data, you can order your in-depth Tarot Personality Profile reading on my website. The Magician is a powerful card symbolising potential, intent and manifestation. The image I have chosen to accompany today's inspirational quotes is from the wonderful Star Tarot created by artist Cathy McClelland. Her Major Arcana set can be purchased on her website, and I'm thrilled to have learned, that she has signed with Schiffer Publishing and is currently working on the Minor Arcana. I can't wait to get my hands on this deck! What is your favourite quote that embraces the spirit of the Magician? 09-05-2012 Update: Cathy McClelland has informed me today, that the Star Tarot will most likely be published by Schiffer in 2014...a long time to wait, but I think it will be worth it! Connect with me on Facebook, Twitter, Pinterest, Tumbr and Instagram. You can find thousands of quotes from famous people on the internet. These quotes can be funny, inspiring, sad, thought-provoking or clever, but each of them also expresses the quintessential meaning of at least one card in the Tarot deck. When I started writing my eBook Empowering Messages from the Tarot in 2009, I came across the following inspirational quote in a self-help book: "Begin, be bold, and venture to be wise"; immediately I thought that this sums up the Fool perfectly. In that moment, my idea of associating quotes from famous people to Tarot cards took shape, which I think is another powerful way to understand and remember individual card meanings. "Begin at the beginning and go on till you come to the end: then stop." 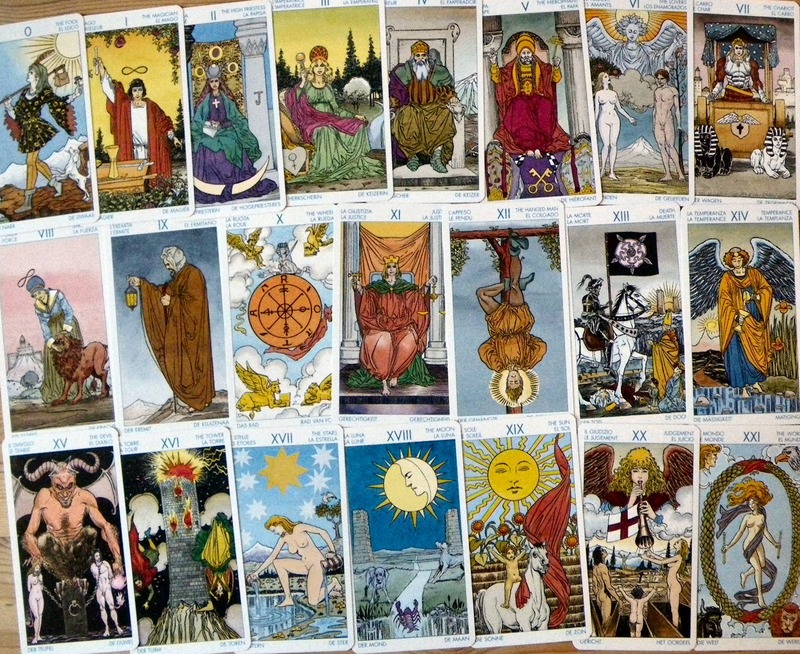 If you enjoy reading fiction, poetry or biographies, you can make your own Tarot card associations with the stories. When you come across some interesting dialogue or description of an event, think for a moment which Tarot card could fit, and how you would gain a deeper understanding of the card you have chosen. Why not give it a try today? And what would be your favourite quote for the Fool? The Tarot is a magical tool to explore the mysteries of life, and once you are more familiar with its astrological correspondences, you can gain deeper insights into the universal energies influencing you and your environment. Today we have the full moon in Virgo; the Tarot card associated with Virgo is the Hermit. The current sun sign is Pisces, its corresponding Tarot card is the Moon. How do these two cards reflect the current energies surrounding us? We see the Hermit sitting in his cosy cave surrounded by his tools: books, maps, crystals, pictures, glass vessels and navigational instruments. 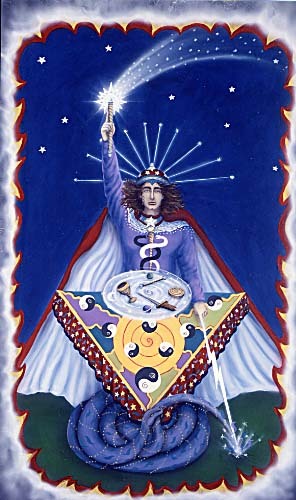 He represents the archetypal alchemist, who is dedicated to seek knowledge and explore the wisdom of the universe. 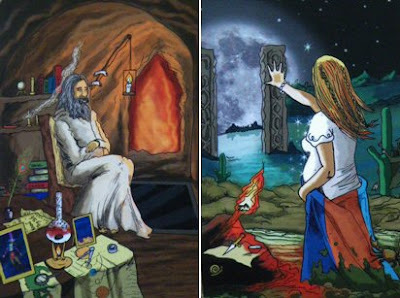 The cave represents the earth, the fire in the background is the warmth and core of the earth; the Hermit is deeply connected to the earth. In his solitude he reflects and is dedicated to make sense of the universal mysteries surrounding him. The Moon depicts a woman, who is drawn towards the large full moon rising above the sea between two pillars. The gravitational pull of the moon is strongest when it's full, so at this time of the moon cycle we have the best chance to manifest our harboured intentions, as indicated by the pregnant woman in the image, who is about to give birth. The Moon and Pisces are associated with water, the element of feelings, emotions and love. The various cycles of the moon reflect the changing and unpredictable nature of our feelings and emotions, which cannot be controlled. Virgo/Pisces balancing energies and qualities: earth/water, service/empathy, craft/inspiration, rationale/intuition; science/spirituality, nature/metaphysics; building solid foundations under our dreams and visions; healing by making sense of confusing situations; feeling love without attachment and dependency; grounded and secure amidst the ever changing rhythms of life; bringing order to chaos. 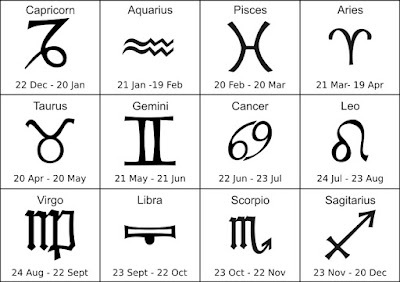 What does the Virgo/Pisces combination hold for you? How do you make use of its energies at this time of the year? What activities do you get involved in to balance your physical and emotional needs? Share your thoughts; I'd love to hear from you! 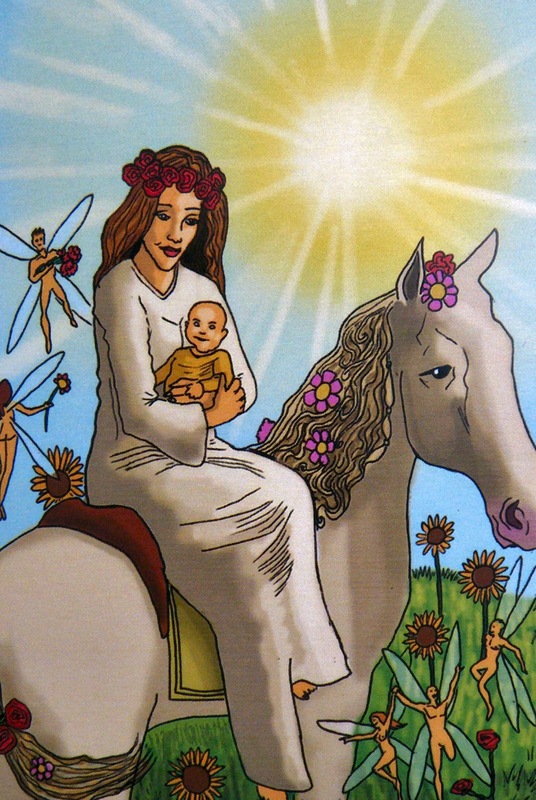 The High Priestess in the King's Journey Tarot is one of the many non-traditional images in this deck. I like Tarot images that sway from the norm as they offer fresh ideas, new insight and a different perspective to a card you may otherwise felt stuck in a rut with. 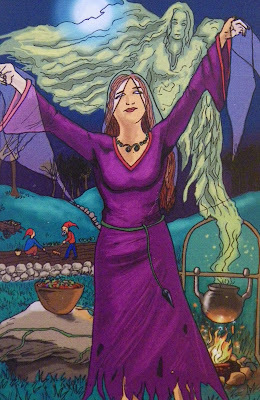 In the traditional Tarot image, the High Priestess is usually portrayed sitting passively in front of a veil holding a book, but here she is more active, standing up, trance-like, summoning a ghostly figure rising from a cauldron behind her. At first sight she looks as if she is lifting a veil. With her open arms she is welcoming and receptive to messages from her subconscious, the otherworld or the universe. It's a night scene illuminated by the full moon. In the background we see two gnomes tending a field, perhaps sowing seeds, suggesting the process of germination or conception. 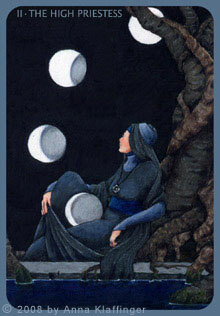 There is a close connection between the High Priestess and the Moon card in the Tarot. Whereas the Moon symbolizes imagination, dreams, emotions and illusions, the High Priestess is using her intuition and introspection to make sense of the lunar influence and its messages lingering in and surfacing from our unconscious. Start developing the power of your intuition to help you make the right choices. Create your own sacred space, where you can read, write, reflect and meditate. Observe the moon cycles and pay more attention to the messages you receive at the time of the full moon. Spend time in nature, especially in parks, forests and woods, where you can listen to the ancient wisdom of trees. When walking on the roots of the trees, you can connect with your own roots. Still your mind with meditation exercises such as yoga and T'ai Chi. A congested body also creates a congested mind; reduce consumption of alcohol and junk food to avoid energy blocks. Nurture your soul by enjoying simple pleasures such as smelling your favourite flowers, listening to relaxing music or taking a dance class. Pay attention to your feelings and emotions. Making a sensible decision may not be right, if you don't listen to your heart. If you are approached for guidance and advice, ensure you see the big picture, so you can provide wise counsel. Affirmation: My mind is tuned in to my environment, and I am receptive to all possibilities. What is the High Priestess inspiring you to do today? How can you best use your intuition at this time? What dreams have you had lately that make you explore their deeper meaning? For more empowering messages from the High Priestess and all the other cards in the Tarot, please check out my eBook. After the first signs of Spring, the weather in Leeds has returned to its miserable self today; the overcast sky and the sleety rain showers shroud the rooms at Cosmic HQ into semi-darkness. What can I do on a gloomy Sunday afternoon? Cleaning the house? No. Cooking some food? No. Watching some TV? Maybe later. Lighting some candles and burning some scrumptious incense? Yes. Doing something Tarot-related? Now we're talking. OK, I've shuffled my King's Journey Tarot deck and now I'm pulling just one card to see what comes up. Lo and behold, it's the Sun. What are my first thoughts about this card? Well, I can see the irony in it considering the adverse weather conditions outside, while I'm waiting for some profound messages to pop into my head about this card. Have you ever noticed that happiness is not a dependency, it is a decision? You don't actually need anything to be happy. It's not something that comes from outside, it comes from inside, and when you radiate a happy energy you'll be amazed what it attracts into your life. Don't worry, be happy...sound familiar? Decide now, be happy, and watch magic begin to enter your life. Yes, I think this empowering message sums up the Sun quite nicely. Happiness does indeed come from within; it’s about having a positive attitude to life regardless of what you own, how successful you are, what life throws at you or indeed what the weather is like outside. 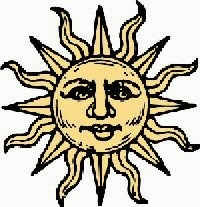 I also find that when the Sun turns up in a reading, life may not be all hunky-dory, but it can be a reminder that all isn't as bad as it seems. And if it does appear in your darkest hour, then perhaps it acts as reassurance that there will be light again and a new sense of purpose. The Sun is life, and it's asking you to choose life regardless of your circumstances. In return, life will choose you with all its magical experiences. What are your creative urges that you wish to fulfil? How can positive thinking today help you improve your day? What do you feel enthusiastic about? What makes the King's Journey Tarot extra special is the additional suit of Spirit, which is modeled on the kabbalistic Tree of Life. The ten numbered Spirit cards represent the ten Sephiroth, where the Ace represents Kether, and Ten represents Malkuth. The Spirit suit has been designed to represent our inner sanctum, where the four traditional suits and indeed life flow in perfect balance. It holds our core beliefs, which can change depending on our experiences over time, but their force always influences our essence, our daily lives. 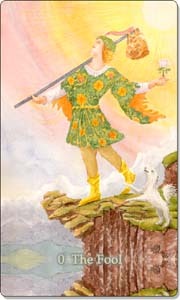 The suit of Spirit in the King's Journey Tarot offers an additional subtle nuance to a reading. Spirit can emphasize a need to nurture spiritual balance and well-being. With the Spirit suit we can explore virtues and vices as well as spiritual gifts that are available to us. 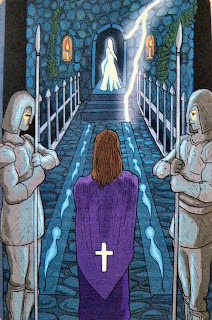 The symbol of the Spirit suit are glowing sperm-like shapes; here in the Ten of Spirit they light the way towards the ghostly figure in the doorway. This card is associated with Malkuth, the material world. When this card comes up in a reading, it may ask you to evaluate your lifestyle, especially in connection with material gain and attachment to possessions. Journey inward and explore your true purpose in life; focus on spiritual fulfilment. Affirmation: I choose what is good for me to reach spiritual enlightenment. My wealth is spiritual fulfilment. What is your attitude towards accumulating money and possessions? Is gaining material wealth your purpose in life? How do you nurture your spiritual needs? How do you feel about the addition of a Spirit suit in a Tarot deck? Do you feel it works well, or do you think Spirit is already integrated in a traditional four-suit deck? Let me know; I'd love to hear from you!